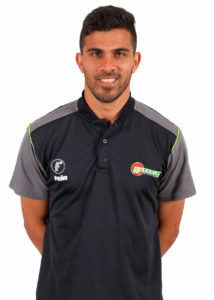 Yaseen Vallie was born 30 July 1989, the right-handed batsman has played for the Western Province, Cape Cobras, South Africa Academy and Warriors teams. He started playing cricket when he was 8 years old in indoor cricket and then when he was 9, he went to into hard ball cricket. In 2008 Vallie went to the Under-19 World Cup with the South Africa Under-19s team. On his franchise debut, he scored 150 which he touts as his most memorable cricket moment to date. Vallie made his First-Class debut in 2009, his List-A debut in 2008 and his T20 debut in 2011. His cricket role model is Hashim Amla, whose style of play he looks up to very much. In the Warriors team Vallie brings calmness, experience and lots of smiling, off the field he likes spending time with his family and friends. Vallie enjoys playing FIFA, which is why, if he wasn’t a professional cricketer he would be a professional football player.